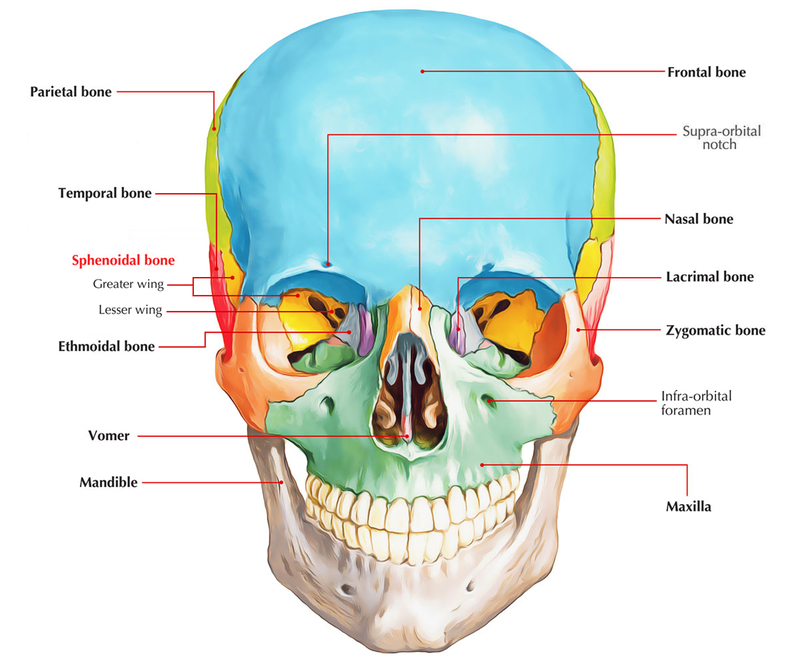 It is an unpaired bone situated at the base of the skull. Its resemblance is of the shape of a butterfly or bat with outstretched wings. 2 pterygoid processes represent the legs of the bat. It includes a pair of sphenoidal air sinuses and is cuboidal in shape. The body presents 6 surfaces: superior, inferior, anterior, posterior and left and right lateral surfaces. A triangular projection between the 2 lesser wings called Ethmoidal spine. It articulates together with the posterior margin of the cribriform plate. A flattened plate of bone behind the ethmoidal spine called Jugum sphenoidale. A shallow transverse groove, which leads on every side into optic canal called Sulcus chiasmaticus. A horizontal elevation creating posterior limit of sulcus chiasmaticus called Tuberculum sellae. On every side it presents small conical projections, the middle clinoid process. Dorsum sellae, a square plate of bone which projects upwards and presents a conical projection on every side referred to as posterior clinoid process. Sella turcica is combined name given to tuberculum sellae, hypophyseal fossa and dorsum sellae. It resembles a Turkish saddle. Sphenoidal rostrum, a median ridge projecting downward. It inhabits the groove between the alae of Vomer. Sphenoidal concha, a triangular plate of bone on every side of rostrum which articulates with the alae of Vomer. Vaginal process, a triangular bony ledge projecting downwards and medially from the base of every medial pterygoid plate. It will help create vomerovaginal and palatovaginal canals. A vertical median ridge which articulates with all the posterior border of the perpendicular plate of ethmoid to create part of nasal septum. On every side of the sphenoid crest is located the opening of sphenoidal air sinuses. Upper vertical parts of sphenoidal conchae, it is located on every side of the crest. 4. Posterior surface is quadrilateral in shape and articulates by a plate of hyaline cartilage with the basiocciput. 5. Every lateral surface of the body joins with the greater wing of sphenoid (projecting laterally) and the pterygoid process (going downwards). The lateral surface presents a groove named carotid sulcus generated by the internal carotid artery. Every lesser wing appears from the anterior part of the body of sphenoid by 2 roots. Between these 2 roots is located the optic canal. The projecting medial ends of the lesser wings are termed anterior clinoid processes. Every greater wing spans outside laterally from the side of the body creating the floor of the middle cranial fossa. Upper surface: It is located in the middle cranial fossa. Lateral (temple) surface: It’s split into temporal and infratemporal surfaces by the temple crest. Anterior (orbital) surface: It is located at the lateral wall of the orbit and divides the superior orbital fissure from the inferior orbital fissure. The observation of sella turcica in radiographs of skull is of great clinical importance because pathological changes in it represent intracranial space-occupying lesions like pituitary tumor.